This beautiful bracelet reminds me of cool water. This bracelet takes advantage of sparking Swarovski crystal beads in daisy flower and cube shape attached as "charms". Then, I mixed in three variations of inexpensive glass crystal beads, and added a nice toggle clasp. 2 Swarovksi crystal cube beads (choice of size and color). Swarovski Crystal Cube Beads on eBay. I used 8mm sapphire. 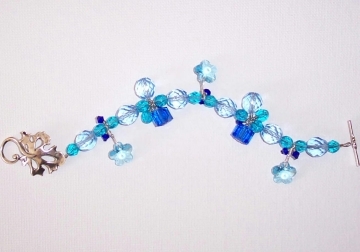 3 Swarovski crystal daisy flower beads. 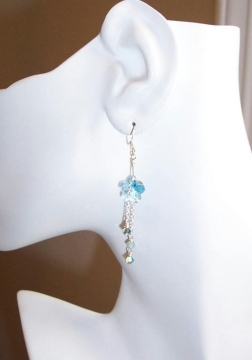 Swarovski Crystal Daisy Flower Beads on eBay. 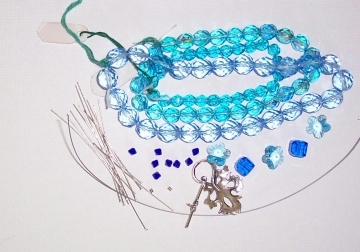 Two different sizes of blue colored glass crystal beads (enough for length of bracelet minus clasp). 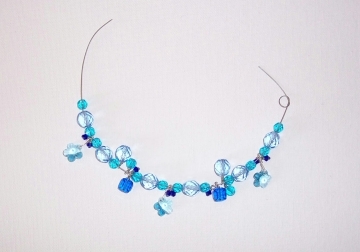 I select two strands (10mm blue, and 6mm aqua round faceted glass beads). TIP - If you buy a whole strand of each color, you'll save money and will have plenty of beads left over for more designs. Length of flexible beading wire to fit the desired bracelet length, plus a couple extra inches to work with. First, prepare the three crystal flower beads. 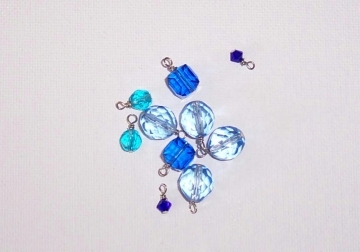 These are top-drilled beads, so you will need to wire wrap these as you would a briolette bead. Follow my instructions for wire wrapping a briolette to make a closed loop at the top. Once you have completed the closed loop on top, attach two small bicone crystal beads to the top loop of your flower bead, using headpins. Use your round nose pliers to create a basic closed loop. If you need help learning to make a loop, follow these instructions. 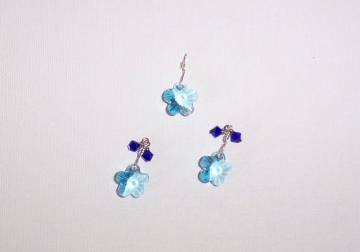 This creates a daisy flower "charm" with two smaller crystals attached to it. Let's assemble the rest of our "charms". Slide a crystal cube bead onto a headpin, and make a closed loop at the top. Repeat for the other crystal cube bead so you have two cube charms. Slide a bicone crystal bead onto a headpin and make a closed loop at the top. Repeat for a second crystal bead so you have two bicone crystal harms. Slide a smaller glass crystal bead onto a headpin and make a closed loop at the top. Repeat for a second bead so you have two smaller glass bead charms. Slide a larger glass crystal bead onto a headpin and make a closed loop at the top. Repeat for a second bead so you have two larger glass bead charms. Next, let's string the beads! 8) Attach a cluster of bead charms - attach a small then large glass crystal, a cube crystal, and the smaller crystal all in a row. When the bracelet beads are pulled tight, the beads will fan out into a spray cluster of beads. 16) Attach a "spray" of bead charms - attach a small then large glass crystal, a cube crystal, and the smaller crystal all in a row. When the bracelet beads are pulled tight on the wire, the beads will fan out into a spray cluster of beads. That's it! 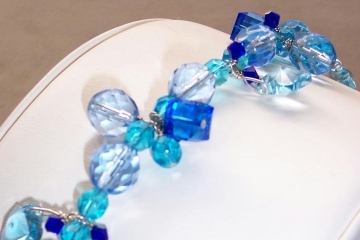 Your gorgeous new blue crystal bracelet is ready to wear! 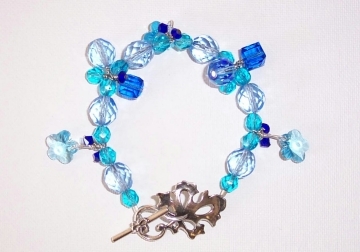 This bracelet looks great paired with other blue crystal jewelry. Try these additional jewelry projects.